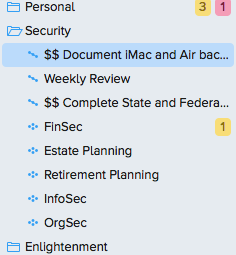 I recently consolidated several items in my OmniFocus project hierarchy into a new Area of Focus I named Security, containing all projects and next actions that are essential to maintaining my personal security. Two projects, each starting with “$$”. I prefix all my projects with “$$ “ in OmniFocus so I can quickly search for them. My Weekly Review activity. This is a hierarchy of sub-projects and next actions that cover all the steps in my weekly review process. I suppose this could be a “real” project, but my preference is to leave it this way. My Retirement Planning and Estate Planning activities. These could just as easily be projects, but I prefer to keep them as catch-all areas for now. They are important undertakings, but I have not clearly identified final outcomes for them. FinSec, i.e. Financial Security. This focus sub-area encompasses non-project activities managing my financial responsibilites. Examples include “Pay phone bill”, “Pay Tom $100 for theater tickets”, and “Close savings account at the World Bank”. InfoSec, i.e. Information Security. 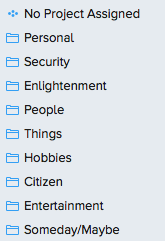 This focus sub-area encompasses non-project activities securing all my important information and online reputation. Examples include: “Update my about.me page once per year”, “Confirm all backups are operating correctly”, and “Confirm virus software is up to date on home computer”. OrgSec, i.e. Organizational Security. This is my newest focus sub-area. It encompasses all non-project activities maintaining my GTD system. Examples include: “Document my end of month review process”, “Perform weekly review”, and “When garden club newsletter arrives, add summer meetings to calendar”. So far, the my Security area of focus is meeting my expectations. I have all of the activities essential to keeping me safe and secure captured and organized into a logical area of focus.